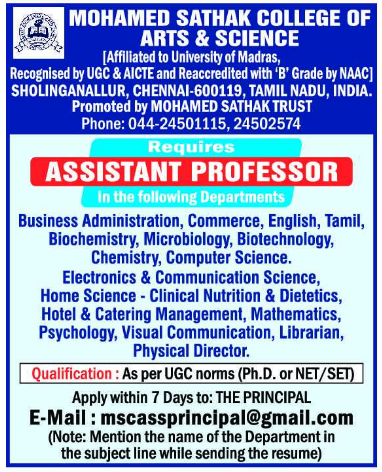 Mohamed Sathak College of Arts and Science, Chennai has advertised in THE HINDU newspaper for recruitment of Assistant Professor Plus Non-Faculty jobs vacancies. Interested and eligible job aspirants are requested to apply within 07 days fro,m 17th April 2019. Check out further more details below. About College: Mohamed Sathak College of Arts & Science was established in 1991, by the Mohamed Sathak Trust with the sole aim of spreading quality education. A coeducational institution it is affiliated to the University of Madras, and approved by the AICTE. The College situated in Sholinganallur (near Chennai) on the IT corridor offers 17 Undergraduate, 11 Postgraduate, 3 Diploma courses and 6 Research programmes to 4000 students. How to Apply: Interested candidates are requested to send CV along with copies of certificates and recent PP size photo to the postal address or email address provided below. Mention the name of the department in the subject line of email while sending resume.